According to a recent report compiled by Transparency Market Research (TMR), the competitive landscape of the global medical device technologies market is estimated to show remarkable growth owing to the technological advancements in the health and medical sector. The technological advancements used in medical gadgets has ensured a notable development in terms of treating illness and diagnosing them. Some of the major players of the global medical device technologies market are Baxter International Inc., Boston Scientific Corporation, Johnson & Johnson, Medtronic plc, and Smith & Nephew plc. The market is mostly dominated by companies manufacturing in vitro diagnostic devices as they hold the maximum revenue share of the market. Nevertheless, small players are leaving no stone unturned in order to secure their place in the market worldwide. As per the TMR report, the global medical device technologies market is anticipated to earn US$563.8 bn by the end of 2025. The market is estimated to expand with a CAGR of 4.6% within the forecast period of 2017 to 2025. Based on end user, academics and hospitals and research segment is seen to be leading the market share. From a geographical perspective, the market is seen to be dominated by North America followed by Europe. 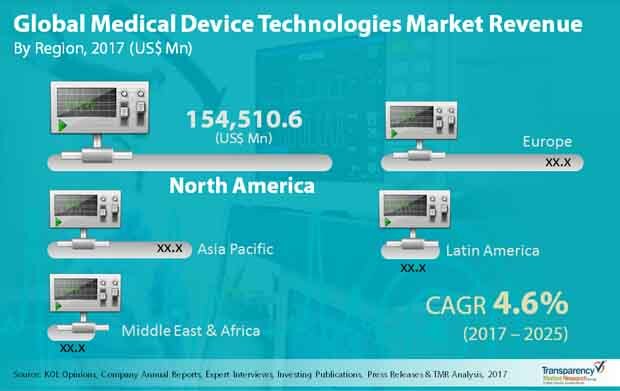 The market for medical device technologies is mainly dominated by the regions of North America, Middle East and Africa, Asia Pacific, Europe and Latin America. Among these, the market in North America is seen to be holding the lion’s share owing to the increase in the number of patients of both metabolic as well as chronic diseases like cancer, and cardiovascular diseases. These kind of diseases demand both critical therapeutic treatment and diagnosis along with extra care of the patient. The presence of numerous manufacturers in the region is also drawing more revenue generation of the North American region. Apart from that, automated medical processes demand is also expected to fuel the medical device technologies market in the years to come. Medical sector technologies have also brought out to be sustainable, productive as well as efficient in terms of healthcare facilities. It is also accompanied by smart gadgets like ultrasound systems, and constant glucose monitoring system along with other medical devices. At present, many clinics and hospitals are focusing more on installation of automated processes and implementing them in order to lower the possibility of errors as it is concerned with the patient’s wellbeing. This is further adding to draw more revenue share into the overall market, hence boosting the market growth. Other factors anticipated to boost the demand for medical device technologies in the market are quick and steady data analysis along with workflow automation. Although the medical device technologies market is seeing rapid growth, factors like the increasing incidence of non-license technology for integrating biomedical devices may act as a hindrance to the overall growth of the market in the future years to come. However, the introduction of hi-tech devices bringing positive results have offered lucrative opportunities for the future growth of the market in the long run. The information presented in this review is based on a TMR report, titled, “Medical Device Technologies Market (Device Type - In Vitro Diagnostic (IVD) Devices, Cardiology Devices, Diagnostic Imaging Devices, Orthopedic Devices, Ophthalmology Devices, Endoscopy Devices, Diabetes Care Devices, Wound Management Devices, Kidney/Dialysis Devices, Anesthesia and Respiratory Care Devices; End-users - Academics and Research, Hospitals, Clinics, Diagnostic Centers, and Ambulatory Surgical Centers) - Global Industry Analysis, Size, Share, Growth, Trends and Forecast 2017 – 2025”.